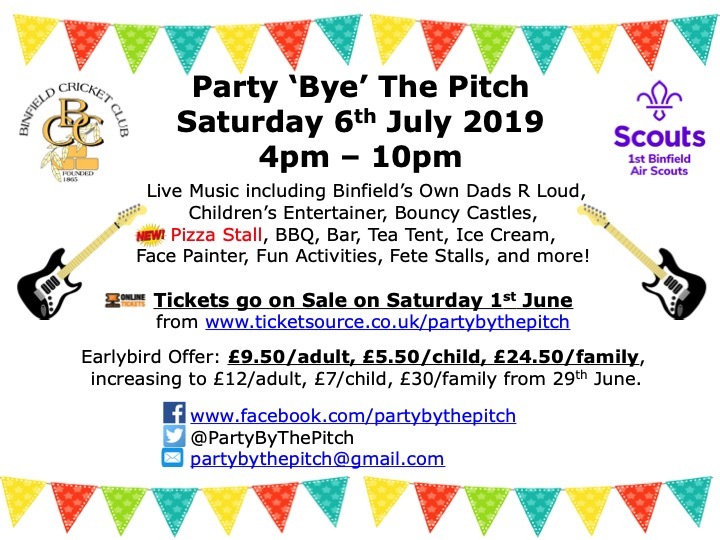 The annual fundraising event for Binfield Scouts and Binfield Cricket club. Event opens 4.00pm. Licensed bar until 9.45pm. BBQ food available until 7.30pm. Event closes at 10.00pm. Tickets are priced at £12 for adults, £7 for children/OAPs, and £30 for a Family of 2 Adults + 2 Children. *EARLYBIRD OFFER* Before 29th June, Tickets are available at the special discounted rate of £9.50 adults, £5.50 children/OAPs and £24.50 Family of 2 Adults + 2 Children. Please note that there are to be no unaccompanied children at this event. Individual child tickets purchased without an accompanying adult ticket also being purchased will be refused. Child tickets must be purchased for all children under 18 years of age (except for babes-in-arms).